"One of the largest government-assisted deals offered to a foreign firm." Guaranty Bank, a deeply troubled Texas lender, was sold on Friday to Banco Bilbao Vizcaya Argentaria of Spain in one of the largest government-assisted deals offered to a foreign firm. The federal government agreed to absorb most of the losses on $11 billion of Guaranty Bank assets in the sale agreement. Federal regulators seized Guaranty Bank and simultaneously brokered the sale of its branches as well as most of the deposits and assets to BBVA Compass, the Spanish bank’s American subsidiary. The government, however, agreed to absorb most of the losses on $9.7 billion, or more than 80 percent, of the Guaranty assets included in the deal. The failure is the fourth-largest since the financial crisis began, and the Federal Deposit Insurance Corporation projects that it will cost its deposit insurance fund about $3 billion. Regulators also arranged for the sales of three smaller banks in Alabama and Georgia on Friday, bringing the total number of bank failures so far this year to 81. That compares with only 25 bank failures in all of 2008. News that BBVA had submitted the winning bid leaked out earlier this week, but regulators waited until late Friday to orchestrate the takeover. That may be another sign that confidence in the financial system is being restored, since in contrast to past leaks, regulators did not immediately seize the bank over fears of rumors stoking a bank run. Stockholders in Guaranty Bank will be wiped out, but the deal ensures that its depositors will not suffer losses. Although BBVA did not take control of the failed bank’s $344 million of brokered deposits, the F.D.I.C. said that it would reimburse brokers directly for those funds. The government also agreed to shoulder the bulk of the losses on all of Guaranty’s loans — a deal sweetener that the government has rarely extended to overseas buyers. BBVA agreed to buy $12 billion of the $13 billion assets left at Guaranty Bank, which it will ultimately sell to private investors. The F.D.I.C. agreed to take on the remaining $1 billion of assets, as well as cover losses on the $9.7 billion pool of risky loans that BBVA bought. The agreement calls for the government to take on about 80 percent of the first $2.3 billion of losses, and 95 percent of the losses above that threshold. Loss-sharing agreements have become a standard part of the F.D.I.C.’s toolkit for resolving troubled banks, but rarely have they covered such a big portion of a failed bank’s assets. And seldom are they offered to foreign buyers. Indeed, it appears the last time that an overseas bank received federal assistance in a failed bank deal was when the Bank of Ireland scooped up four New Hampshire banks in September 1991. Analysts say the BBVA deal may signal that the F.D.I.C. will be more open to bids from foreign banks. Many of the strongest American banks are occupied with deals they did last fall, while private equity firms have struggled to meet the high bar set by regulators. Weaker banks, meanwhile, have been hamstrung by their own losses. That has left regulators scrambling to drum up buyers. José Maria Garcia Meyer, the head of BBVA’s American operations, said in a statement that the deal provided convincing evidence of the bank’s strength and stability during the current crisis. “This transaction further demonstrates BBVA’s clear commitment in building its U.S. franchise,” he added. Along with its Spanish rival Banco Santander, BBVA has been ramping up its business in fast-growing American markets that have strong ties to Latin America. It made a series of expensive acquisitions in Texas over the last few years. Guaranty, which is based in Austin, will add another 103 locations in Texas and 59 branches in California, where BBVA has been trying to establish a beachhead. That will give it a total of 767 locations in seven Sun Belt states and make it the nation’s 15th-largest commercial bank with about $49 billion in deposits. Gov. Rick Perry's efforts to disrupt challenger Kay Bailey Hutchison's announcement tour have included a billboard-sided truck announcing the "Kay Bailout Express. " 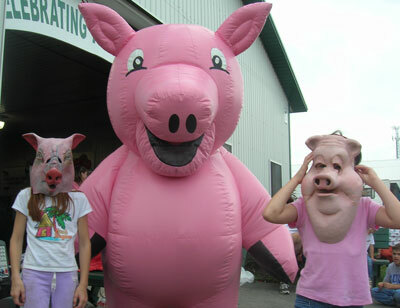 In Austin, Perry supporters wore pig masks and handed out "Kay Bailey bailout bucks." Perry is confident his supporters don't like Hutchison's vote last year for the initial financial bailout sought by the Bush administration. But not some of the monied interests that are part of Perry's team. One of Perry's biggest political backers - Austin banker James Huffines - got nearly $88 million in the payout to save banks and Wall Street. Huffines is president of Plains National Bank Financial and executive vice president of the bank's holding company, Plains Capital Corp. He's a top Perry fundraiser and a member of Perry's political "kitchen cabinet" of advisers. Plains Financial got $87.6 million last December. According to federal documents, the bank has yet to repay the money to the federal government. Huffines is long-time Perry supporter - he guided his transition and first inauguration and headed Perry's 2002 reelection fundraising. Perry gave him a plum appointment to the University of Texas Board of Regents. Huffines is not the only Republican - and Perry supporter - to embrace federal bailouts. Many GOP members of the Legislature voted to accept $16 billion in federal stimulus money to balance the Texas state budget. "Our founders never intended for debtor's prisons to substitute for a tax system." Sen. Eliot Shapleigh, D- El Paso, urged the Department of Public Safety Commission Friday to make immediate changes to the Driver Responsibility Program, which critics fault for disproportionately socking students and low-income Texans with expensive fees. Warrants get issued to those who can't pay and results in more uninsured drivers on Texas' roads, he says. Shapleigh wants the commission to create a public awareness campaign and an indigent program that would exempt people from paying surcharges, in addition to a "good driving behavior" program. In El Paso, 11 percent of drivers had outstanding warrants attributable to the Driver Responsibility Program, Shaplaigh says. A driver faces an arrest when they fail to pay excessive fines and then do not show up for municipal court hearings. Those drivers' responsibility cases are clogging municipal courts. Points are accumulated for moving violation convictions. After six points, drivers must pay a $100 surcharge each year for three years. Each additional point on a driver's record costs an extra $25 a year. Texans caught driving without proof of insurance must to pay a $250 fee, plus an automatic annual surcharge of $250 for three years from the date of their conviction, making the total cost of the violation $1,000. And a driver who commits one of the latter two violations again within that three years get hit with an additional annual surcharge. Many people facing surcharges simply do not pay. By October 2008, of the 1,121,348 drivers required to pay surcharges, 783,536 did not pay, a roughly 30 percent rate of compliance. That means, of the more than $900 million in surcharges billed, less than $300 million have actually been collected. Texans affected by these automatic surcharges are first-time offenders, students, single parents or low-income parents. The driver program confronts, these vulnerable Texans with the choice of either complying with the law, or paying for their education, rent, food for their families or emergency expenses like car repair or medical bills, Shapleigh says. A Legislative Budget Board report says the program has failed to fund trauma care centers and disproportionately hurts students and low-income or indigent Texans who cannot afford to pay the costly surcharges. "Here's a terrible program that used punitive fines to plug holes in the budget. Some face $1,750 fines for a first time offense. Of the 1.6 million in the program, (nearly 1.1 million) can't pay. 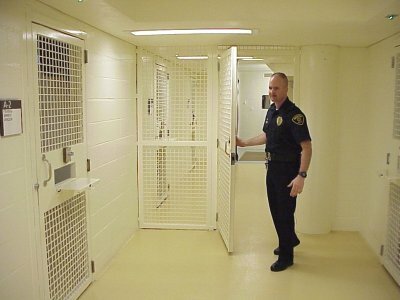 Our founders never intended for debtor's prisons to substitute for a tax system," Shapleigh says. Earlier this year, Shapleigh succeeded in amending some of the provisions on to the DPS Sunset bill, which would exempt people living at or below 125 percent of the federal poverty level from paying surcharges. THE Macquarie satellite business model is being pared back further, after Macquarie Infrastructure Group (MIG) revealed it could split and internalise its management. MIG, the embattled Australian and US toll-road owners, is pursuing a plan to divide its portfolios of assets into two ASX-listed funds in a bid to reverse its falling security price. The plan came as MIG reported a $1.7 billion net loss for the full year, down 323 per cent from the $767.3 million profit recorded a year earlier. The sharp loss in profit was blamed on weaker global economic conditions and the 3.4 per cent decline in traffic on the fund's international network of toll roads. The decision to potentially split the assets, which Deutsche Bank sales traders termed "good-MIG, bad-MIG" came after nearly six months of investigating options to raise the flagging stock price. MIG wrote down the roads portfolio by $3.47bn from December last year, to be worth $5.1bn, which prompted the net asset backing to be cut from $3.84 to $2.54 per security. The MIG stock, though, is trading at only $1.36 on the market, after it dropped by 6.2 per cent yesterday. MIG chief executive John Hughes said the board contemplated a fresh capital raising or asset sales. However, an equity raising was ruled out because it would dilute current shareholder value. "It is considered that splitting MIG into two portfolios is the most opportune way to add shareholder value in the short and medium term," Mr Hughes said. "That will also allow us to directly address the leverage issues that a lot of commentators have made mention of. It seems that leverage is having the greatest issue on our security price." Mr Hughes confirmed MIG held $30bn worth of debt across its portfolio, but said "that was appropriate for the financing of the assets". "We have spent the last six months going through a range of options, and we are now going through them in finer detail," he said. 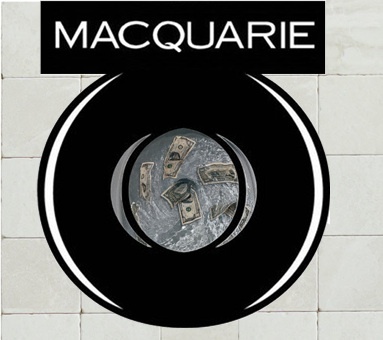 "The independent board committee will work through with Macquarie on any internalisation." MIG's plan to internalise management follows identical moves by Macquarie Leisure Trust and Macquarie Airports (MAp), which have cut ties with the investment bank parent. The negotiations to spin off from Macquarie are expected to deepen in the next few weeks, but analysts have estimated it could cost MIG up to $689m. Analysts initially criticised the $345m demanded by Macquarie when MAp announced its breakaway in late July. White Funds Management director Angus Gluskie said a portfolio division was preferred by investors, instead of the capital raising or asset sales. "Their strategy is designed to try and suit the disparate views of shareholders, because there are people in the marketplace with different agendas," he said. "I think management have done the right thing of not going down the path of raising capital, because that would be dilutive, and not selling assets. "From a short-term point of view, there are investors in the market who would prefer them do that and derisk the stock. "But from the medium to long-term perspective, that isn't the right thing to do." "The names released will include well-known personalities, and if the IRS prosecutes it could be very embarrassing." UBS to Give 4,450 Names to U.S. The U.S. could within months begin criminally prosecuting hundreds of wealthy Americans -- from the obscure to the "rich and famous" -- for using foreign bank accounts to evade income taxes. In a settlement with the Swiss government detailed Wednesday, the Internal Revenue Service said Swiss bank UBS AG will ultimately turn over the identities behind 4,450 secret accounts. At least $10 billion had been stashed to avoid payment of U.S. taxes or the disclosure of foreign accounts, according to a person familiar with the matter. The U.S. government investigation and settlement ultimately could produce some 10,000 account identities. Separately, the Swiss government said it is exiting from its six billion Swiss franc ($5.6 billion) investment in the bank, made as part of a rescue package at the height of the financial crisis. It was lining up investors to buy its 332 million shares late Wednesday, and the sale was expected to be completed soon. No details on the sale price were given. The disclosures in the tax settlement represent a major crack in Swiss bank privacy, where a tradition of discretion has been a hallmark. After a long court battle -- and skirmishes in closed, diplomatic sessions -- the U.S. and Swiss governments detailed the process by which those names will be revealed to U.S. tax officials and criminal prosecutors. The process is a balky one, involving cooperation between Swiss and U.S. tax authorities that has little precedent. The first release of about 500 identities will get under way in the next few weeks, with the remainder released in batches in the months ahead. The names will be first turned over to a Swiss tax administration in Bern, the Swiss capital, which will review the names before they are transmitted to U.S. authorities. The IRS, working with the Justice Department, then will review the cases to determine whether they should be criminally prosecuted. Lawyers advising UBS clients said the identities will run the gamut. 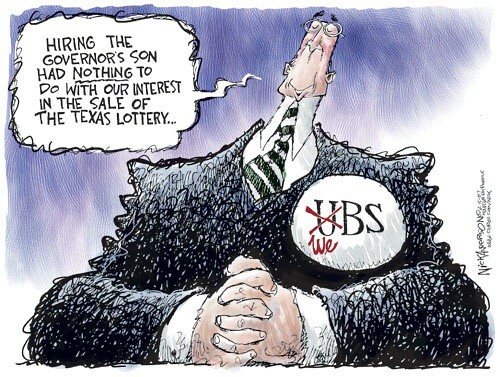 All likely have assets in UBS accounts totaling more than $1 million and used complex trusts and foundations in the Cayman Islands, British Virgin Islands, Liechtenstein and Hong Kong to enshroud their identities. "The names released will include well-known personalities, and if the IRS prosecutes it could be very embarrassing," said Charles E. Falk, a Mendham, N.J., attorney who represents more than two dozen UBS clients. Disclosure of the U.S.-Swiss deal generated a flurry of calls to tax attorneys from worried UBS clients. In recent weeks, many already had come forward through an IRS disclosure program. William M. Sharp Sr., a Tampa, Fla., tax lawyer, said the government, by keeping the names secret, is likely to spur evaders to report themselves to authorities. On Wednesday, U.S. and Swiss officials, operating simultaneous press conferences, both claimed victory for a carefully crafted seven-page settlement that respects both nations' laws. "This is no mere keyhole into the hidden world of bank secrecy," IRS Commissioner Douglas Shulman said. "This agreement represents a major step forward with the IRS's efforts to pierce the veil of bank secrecy and combat off-shore tax evasion." In Bern, President Hans-Rudolf Merz said the agreement respects Swiss law. The Swiss negotiators achieved an agreement that preserves Switzerland's "important interests," Mr. Merz said in a press conference. But both the IRS and the Justice Department will be under pressure to ensure that the names of the UBS clients ultimately end up in the hands of the IRS. That the settlement allows the Swiss government to first review the names raised concerns that the process could drag out. In a statement, Sen. Carl Levin, (D., Mich.), who chairs a Senate panel that has revealed many off-shore banking secrets, including those at UBS, in recent years, said: "The UBS settlement is at most a modest advance in the effort to end bank secrecy abuses, tax haven bank misconduct, and the tax haven drain on the U.S. treasury. It will take a long time before we know whether this settlement will produce meaningful gains." UBS's name has been stained over the past two years by a multitude of problems: billions of dollars in losses tied to U.S. subprime securities and the U.S. tax-evasion probe, which was aided by a whistleblower former private banker. Slowly, under Chief Executive Oswald Grübel, the bank is trying to move forward. Swiss and U.S. officials intensified talks in June but remained far apart on details. U.S. officials, for example, wanted assurance that UBS clients couldn't use Swiss tribunals to cause endless delays in producing account information. Swiss officials demanded that the Justice Department drop any threat of possibly punishing UBS if the tribunals blocked some data release. U.S. Deputy Attorney General David Ogden, the highest ranking official handling the case, convened a June 9 video conference call with Swiss Justice Minister Eveline Widmer-Schlumpf, according people familiar with the call. The two agreed a deal was possible to avert a July hearing in Miami and to push lawyers to try to produce an agreement, these people said. By July, talks still dragged on. Swiss authorities filed a court brief threatening to block any release of account data even if a U.S. court ordered UBS to produce the information. At one point, the Justice Department said it would ask a court to declare UBS in contempt. Mr. Ogden and Michael Leupold, a deputy Swiss Justice minister, talked by phone on Aug. 6 and 7 to try to move the talks along. The sides were close enough that the officials set up a visit by a Swiss delegation to Washington. Mr. Ogden convened a final meeting with Mr. Leupold and Michael Ambuhl, a senior Swiss diplomat, on Aug. 11, with lawyers at the Justice Department building in Washington. In the end, both sides made concessions: U.S. officials agreed that the cases would proceed first through a Swiss review system. Swiss officials found a way to turn over the names in a way that they say continues to maintain banking secrecy. —David Crawford contributed to this article. Law Blog: Will U.S. Use Secrecy to Its Advantage? Tax-Cheat Showdown: Fess Up or Stay Quiet? The 2010 Texas GOP primary: "It's got little to do with the real folk of Texas and everything to do with rival Republican kennels." They are like two old show dogs sleeping on the front porch of a Classical Revival mansion while their owners sip Kentucky bourbon and bestir themselves with tales about the parlous condition of their portfolios. 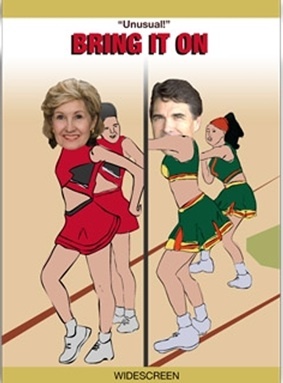 I'm talking about Rick Perry and Kay Bailey Hutchison, the thoroughly domesticated governor and U.S. senator. I mean no offense. Both, after all, would prefer we assess their lengthy tenures in dog years. Perry's nine becomes a youthful one-plus and Bailey's 16 becomes a little more than two. In this way these old curs can argue with long, straight faces that it's time to throw his/her mangy rascal of an opponent off the porch and hire someone who'll do the job right. This is a bad time for old tricks. If 2008 was an election about change, 2010 is shaping up to be an election about spare change, as in do you have some. Texas has lost more jobs than every state but California. The mailman brings nothing but bad news, including these mysterious toll road bills generated automatically when we drive to the corner store, thereby doubling the price of our lottery tickets. The oil fields are playing out, the water holes are drying up, few can afford to see the doctor, and our state education leaders want to teach that Fred Flinstone and his pet dinosaur Dino were historical figures. We better not count on science to get us out of this. And two of the old dogs that led us into this cul-de-sac are each baying about how it's all the fault of the other one. If this were more than a metaphor, the bear would have eaten them both by now. Now, there's something to be said for experience. I wouldn't trade mine for a toll road transponder. But experience is one thing. Fleas are another. The Republican gubernatorial primary really is something like a senior tour version of the Westminster Dog Show. 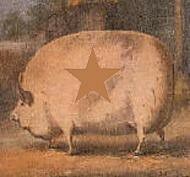 It's got little to do with the real folk of Texas and everything to do with rival Republican kennels. Grooming the burrs out of Perry's coat are homebuilders and insurance companies. Hutchison's getting her hair teased up by more "moderate" bidness types who dab a little eau de public mindedness behind their ears before attending black tie charity events. The Houston Chronicle's Rick Dunham captured all you need to know (actually, all there is to know) about the GOP primary with a blog post about a pissy little dog-walking dominance dance between the campaigns. Hutchison's 18-wheelers surrounded and hid a Perry truck hauling an anti-Hutchison sign thereby winning the daily message contest. And you thought I was just being poetic with the dog thing. The press doesn't much cover dog shows, and so they'll be hard-pressed (pardon the pun) to call this match-up what it is. Better it be seen as a clash of titans, or at least a rumble in the tumbleweeds. Texas voters are so alienated from affairs in Austin that it's still up in the air whether Tom Schieffer or some new Democratic pup will emerge to show up the show dogs. They'd run away with it if Texans knew what was really going on. You can't blame newspapers or local network television affiliates, really. Well you can, but what's the point. State government probably has more impact on the lives of people than government at any other level. But darn, it's expensive to cover and readership surveys just don't give it high marks. So we train our eyes on the old front porch. Every once in a while one of the dog owners will toss a ball into the yard. A tail beats idly on the hardwood. Dog eyes get a "do I have to?" look. A dog rises slowly, shakes itself, and ambles down the porch steps. The ball is fetched. Treats all around. "Wanna know why there's no money for roads? We're paying losers for not even building the roads...at the expense of the taxpayers." 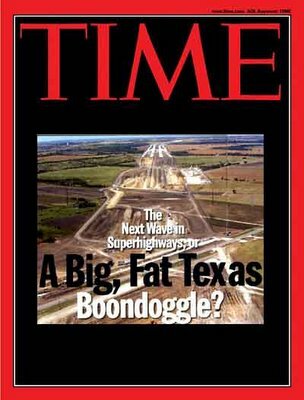 The loser in a bidding war for a toll road in Texas to receive $3.6 million from taxpayers. An unaccountable transportation body in North Central Texas on Thursday awarded $3,615,214 in taxpayer money to a foreign corporation for its failure to produce a winning toll road project bid. 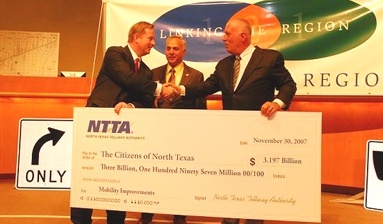 The Regional Transportation Council (RTC) of the North Texas Council of Governments approved the payment to Cintra Concesiones de Infraestructuras de Transporte, a Spanish company, as a "stipend for unsuccessful bidders" and for costs associated with applications the company made for loans that would have been backed by federal taxpayers. Although Cintra received a conditional green light in February 2007 for its bid to construct a 26-mile extension of State Highway 121 as a toll road through Denton and Collin Counties, the state legislature within a matter of weeks expressed second thoughts about the deal. New legislation restricted the private development of certain toll roads and forced the consideration of an alternative bid from the North Texas Tollway Authority (NTTA), a public agency. On June 28, 2007, the RTC voted 27 to 10 to approve the NTTA proposal which was described as "more lucrative" than Cintra's. In return for an up-front payment of $2.5 billion, plus $1.5 billion in future payments, NTTA would have free reign to impose tolls on motorists for the next fifty years. The $4 billion in payments to the state would, in effect, be an advance loan of money that the agency expected to collect from motorists, less the substantial costs for overhead. The switch to NTTA came in spite of Governor Rick Perry's strong support for Cintra throughout the process. In 2004, Perry had even hired his legislative director, Dan Shelley, away from his work as a consultant for Cintra. After the company landed several major state deals, Shelley returned to Cintra in 2006. By 2008, Shelley had collected an estimated $300,000 from the Spanish firm for his work as a registered lobbyist. The payments to Cintra were made possible by Governor Perry's approval of legislation in June authorizing unlimited compensation to losing bidders on toll projects. Denton County taxpayers will pay the most, $1,961,063, to Cintra. Collin County will pay $1,446,086 and Dallas County $253,065. The anti-toll group Texans Uniting for Reform and Freedom (TURF) expressed outrage at the decision to send taxpayer money to Cintra. "Wanna know why there's no money for roads?" TURF Founder Terri Hall asked. "Here's your answer. We're paying losers for not even building the roads. The cronyism is only getting worse, and it's at the expense of the taxpayers." Perry Appointees on Texas Transportation Commission have issued $5 billion of mobility fund bonds since 2001. DALLAS - The Texas Transportation Commission will issue the state's largest tranche of Build America Bonds to date, with $1.1 billion of the taxable debt scheduled to price on Wednesday. The deal comes in the wake of an upgrade from Standard & Poor's that lifted Texas' rating to AA-plus from AA. That put Standard & Poor's in line with Fitch Ratings' AA-plus and Moody's Investors Service's Aa1. The state has already seen a benefit from the upgrade, with BABs from the Texas Public Finance Authority earning one of the lowest spreads against Treasuries - 160 basis points - in an issue this year. The TPFA's $180 million of BABs priced last week as part of a $450 million deal. Jose Hernandez, managing director of debt for the Texas Department of Transportation, said the 30-year maturity for the general obligation bonds was a key factor in the decision to go all BABs on this issue. "The muni yield curve looks very steep toward the long end, and Treasuries are fairly flat," he said. BABs, since being introduced earlier this year as part of the federal stimulus package, have come to market yielding up to 185 to 200 basis points above Treasuries, industry executives say. Senior manager on the deal is Merrill Lynch & Co. with nine co-managers: Estrada Hinojosa & Co., JPMorgan, Piper Jaffray & Co., First Southwest Co., Loop Capital Markets, Southwest Securities, Jefferies & Co., Morgan Stanley, and Wachovia Bank NA. RBC Capital Markets is financial adviser on the deal. McCall Parkhurst & Horton is bond counsel. This deal will rank as the largest for a Texas issuer in a year where deals worth more than $1 billion have been scarce. In the first half of the year, Dallas Area Rapid Transit's $1 billion bond deal included more than $800 million of BABs. The bonds will be issued under the name of the Texas Transportation Commission, which is the five-member board that supervises the Texas Department of Transportation. The bonds are backed by the mobility fund derived from driver's license, vehicle inspection, and title fees among other sources that are expected to total $338 million for fiscal 2009 and $371 million by fiscal 2013. The commission has issued $5 billion of mobility fund bonds since the Legislature created it in 2001. Voters approved the debt program later that year. Mobility bonds have funded projects for the state's eight largest metropolitan areas. TxDOT will allocate bond proceeds for approved projects with two-thirds going to metropolitan areas and one-third going to small urban areas and statewide connectivity projects. The commission projects pledged revenues to run no less than 1.1 times debt service each year. Up to $6.4 billion of additional bonds are permitted if debt-service coverage remains at that level or better as certified by the state comptroller. While this issue takes the bond program close to its limit, the program can be expanded as debt is retired. The commission also issues debt under the title of Proposition 14 and Proposition 12 for the ballot issues approved by voters. In a special session this summer, the Legislature authorized the commission to issue $2 billion under the Proposition 12 fund. Up to $5 billion of Proposition 12 general obligation bonds were approved by voters in 2007 but needed legislative authority before they could be issued. Lawmakers also extended a lifeline to TxDOT and the TTC. Both authorities would have gone out of business under the state's Sunset Law without reauthorization from the Legislature. When the regular session ended June 1, neither was authorized to continue operating after Sept. 1, 2010. But Gov. Rick Perry called the Legislature back into session to reauthorize TxDOT, the TTC, and three other state agencies scheduled to close under the Sunset Law. Hernandez said this week's BAB issue will be the final one for the commission this year. The BABs will be followed next week by $5.5 billion of tax and revenue anticipation notes that have earned top marks from the rating agencies. The Trans are issued annually to smooth cash flows as the state begins its fiscal year Sept. 1. The borrowing represents only 7% of projected general revenues, a share slightly lower than in previous years. Texas Comptroller Susan Combs took the strength of the credit rating as a sign of the state's economic strength. "Certainly, our economy has slowed, but our housing market and business community are not as hard-hit as other states," Combs said. "And our state government continues its commitment to be fiscally responsible by spending taxpayer dollars wisely. This commitment is reflected in the bond rating firms' confidence that Texas Tran notes are a solid investment." With no state income tax, the retail market for Texas debt is not as deep as it is in California or New York. While underwriters will seek retail orders, much of the Texas debt is expected to go to institutional investors, officials said. The Standard & Poor's upgrade on Texas GO debt bucks a trend among the most populous states, with many struggling in a lingering recession. Florida, the largest state to hold a AAA rating from Standard & Poor's, saw the outlook shift from stable to negative Jan. 14. California is rated A by Standard & Poor's with a negative outlook after a downgrade from A-plus on Feb. 2. New York's AA rating with stable outlook was affirmed March 2. 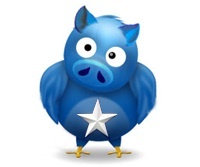 Texas, initially rated AAA by Standard & Poor's in 1961, has not carried a rating of AA-plus since 1987. It is the only state among the top five whose unemployment rate of 7.5% falls below the national average of 9.4%. "We expect that the Texas economy will recover earlier and at a faster rate than most other states given its continued population growth and relatively low cost of doing business, which we expect will contribute to gradual employment gains in 2010, particularly in the health, education, and services sectors," said Standard & Poor's credit analyst Horacio Aldrete-Sanchez. "We can't afford 14 years of one person appointing every state board, agency and commission.It invites patronage. It tempts cronyism. It has to stop." SAN ANTONIO — If there was any doubt that Texans would witness a red-hot Republican race for governor, U.S. Sen. Kay Bailey Hutchison removed it Monday when she kicked off a five-day announcement tour and delivered her harshest attack ever on Gov. Rick Perry. Returning to her native Gulf Coast to announce her bid for governor, she said Perry had overstayed his welcome with an administration marked by arrogance and "tragic" mistakes. Using her old high school about 40 miles southeast of Houston as a backdrop, she also proposed limiting governors to two, four-year terms. She called Perry — a fellow Republican — a "dedicated public servant," but otherwise laid into him. Perry, in office since 2000, is the longest serving governor in Texas history. Perry took over the remainder of former President George W. Bush's second term as governor and has been elected to two, four-year terms since. If he's re-elected in 2010 and completes his term, Perry would have held the job for 14 years. In a gymnasium that drew about 150 supporters and the La Marque High School cheerleading squad — which Hutchison once belonged to — she delivered a broad and harsh critique of the Perry years and warned Republicans would suffer up and down the ballot without a change in leadership. Hutchison said Texas is awash in government debt, leads the nation in uninsured children and suffers from the highest property taxes in the country. She also described Perry's embrace of a business tax overhaul as a job killer. "I call it a tragic mistake," she said. Hutchison singled out the Texas Department of Public Transportation, calling it the "most arrogant, unaccountable state agency in the history of Texas." Under Perry, the department has shunned local input and built too many toll roads, she said. The state's senior U.S. senator also belittled Perry's decision to turn down $550 million in federal stimulus money to help the state's empty unemployment insurance trust fund. She called the move politically motivated and "irresponsible." Her highly critical speech underscored the bitter clash that the Republican primary for Texas governor is becoming. Hutchison had flirted with a gubernatorial run in 2005 but ultimately decided to stay in Washington — avoiding a race that GOP honchos feared would leave the party badly divided. The rancor was evident from the moment Hutchison's vast entourage pulled into the parking lot of La Marque High School, the site of her first event. Perry's aides had already parked a large truck carrying an oversized picture of the senator with a sign emblazoned across the front: "Kay Bailout Express," it read in reference to Hutchison's vote in favor of the 2008 financial rescue package. Perry spokesman Mark Miner also showed up at the gymnasium where Hutchison was speaking and delivered a response before the senator even began her speech. "Once again, the senator is coming up with no ideas," Miner said. "It's easy to criticize after being in Washington for 16 years, but the people of Texas want results not rhetoric." Miner later popped into an event in Houston to distribute copies of a 1993 speech in which Hutchison advocated term limits for members of Congress. Hutchison had said when first elected that she would only serve two terms but later ran — successfully — for a third. Experts predict the race will touch off an ideological divide in the party, with Perry carrying the torch of social conservatives and Hutchison, who has supported the Supreme Court decision that legalized abortion, striking a more moderate tone by comparison. Hutchison has been itching to come home for years. Hutchison has said she will resign her Senate seat this fall to focus on the governor's race. In that case Perry would get to appoint a successor for her unexpired term. Hutchison planned to continue her five-day announcement tour in Houston, San Antonio and Austin as well as 15 other cities. The primary elections will be held in March. Then voters can choose the Democratic or Republican nominee in November 2010. New section will offer less congested route to Houston. You have to know what you're looking for to see the beginnings of construction on yet another Central Texas toll road, at least at the part nearest Austin. Crews have dug the holes and laid the foundations of some of the columns that will be the interchange between Texas 45 Southeast and the new, 40-mile-long extension of Texas 130 as it heads to Lockhart. Near Maha Creek, the median between the north- and southbound lanes of U.S. 183 is a mishmash of black-dirt hillocks as crews work on future bridges over the creek. Further south, near where U.S. 183 crosses Texas 21, owners of an Exxon station recently moved it several hundred feet east of U.S. 183 to make way for the wide tollway and access lanes to come. And down near Seguin, where Texas 130 will meet Interstate 10, concrete pillars for an interchange are poking out of the ground. Construction of Texas' first public-private toll road began quietly several weeks ago, with a lack of fanfare given all the controversy such tollway agreements have generated over the past five years. A consortium called SH 130 Concession Co., led by Spanish toll road operator Cintra and Zachry Construction, is financing the $1.35 billion project and will operate it (and, it hopes, profit from it) over the next 50 years. It should open to traffic in 2012. Just two other public-private tollways in Texas are in the works, both at least two years further back in the development process and unlikely to break ground soon. Cintra is the lead actor on both projects, which involve adding toll lanes on Interstate 820, Texas 183 and Texas 121 in Tarrant County and on the LBJ freeway in Dallas. The new section of Texas 130 (the Texas Department of Transportation built the first 49 miles from Georgetown to Mustang Ridge) will offer a new possibility: getting from Austin to Houston without having to drive through the traffic lights and growing congestion on Texas 71 in Bastrop. But that may be a tough sell. From east of the Austin airport, it's about 85 miles on Texas 71 to Columbus, where Texas 71 meets Interstate 10. Take Texas 130 and I-10 there instead, and the trip will be almost 135 miles, at a cost of more than $7 for a car, close to $30 for big trucks, plus extra gasoline or diesel. Even with higher speed limits — as much as 80 mph on the tollway — that alternative is unlikely to entice many people. It might make sense for people bound for Corpus Christi and the Rio Grande Valley. But Texas 130's main reason-to-be was as a bypass of Interstate 35 in the San Antonio-to-Georgetown corridor. So far, traffic on the 49-mile piece east of Austin that opened in 2006 and 2007 has been light, about 9 percent below projections this budget year. And for an 18-wheeler to take the entire 89 miles, once it's open, the one-way price will be more than $50. Stout. Truckers may need a bypass when they see that, the kind that requires a surgeon. For questions, tips or story ideas, contact Getting There at 445-3698 or bwear@statesman.com.